Commonly known as Victoria Cathedral, The Cathedral of Our Lady of Immaculate Conception is one of the first churches built in Seychelles. Close to the city centre, this beautiful building is located near the Clock Tower in Olivier Maradan Street in Victoria. 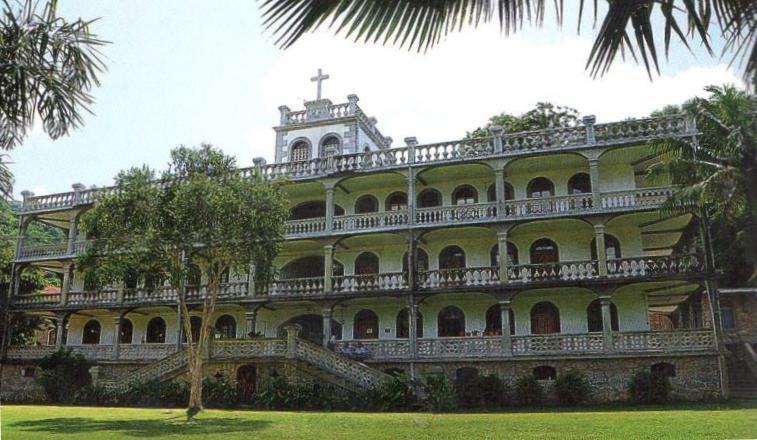 The largest Catholic church in Seychelles, it is beautiful and is built similar to the French style. With peaceful environs, it can make for a soulful visit to calm oneself. The local people of Victoria spend quiet hours in worship here. Visitors flock to see the marvels of the majestic building and its surrounding grounds. 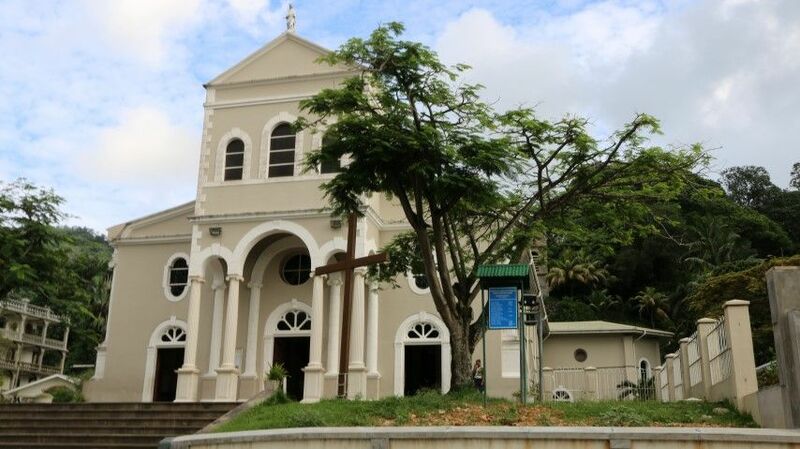 The Victoria Cathedral is the mother church of the Catholic Diocese of Seychelles. Built on the place where Father Leon of Avanchers, in March 1851, set the first vault, the cathedral was devoted to the Virgin of Immaculate Conception. 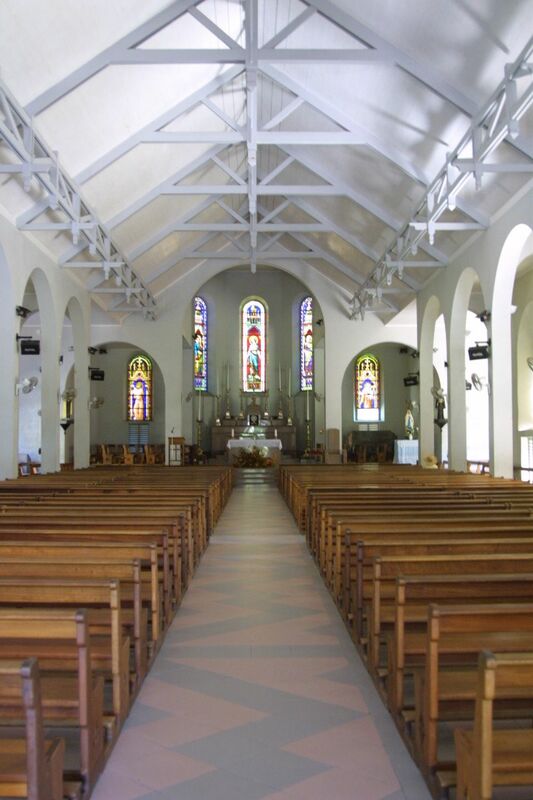 The church was constructed in 1892 and is one of the earliest churches of Seychelles. After a renovation which lasted two years from 1993 to 1995, the entire structure except the exterior walls had a makeover. The new doors with their intricate carvings and a beautiful tabernacle were added by the sculptor of Seychelles, Egbert Marday. In 2001, the cathedral became the final resting place of the first Bishop of Seychelles, Felix Paul. The pristine white building with its regal stone staircase at the main entrance is the single most outstanding feature of the cathedral. This feature is supplemented by white stone pillars that grandly stand on either side of the door. The stained-glass windows throw vibrant colours when touched by sunlight. At the back is the bell tower which was built in 1898. As you step inside the cathedral, you have to climb four stone steps to access the rows of pews which lead to the altar. The pews are made of wood, and there are coloured stone flags all along the aisle. The altar bears fresh flowers and religious artefacts and looks compelling when soaked with the sunshine. La Domus is a two-storey priest house next to the cathedral built in 1834. The house impresses with its splendid granite exterior. The gardens surrounding the cathedral are a sight to behold. The vibrant colours of the flowers, trees and plants make it hard for you to leave the grounds. With space to host 700 people, the Cathedral of the Immaculate Conception has plenty of space for local worshippers as well as tourists. Enjoy the peace and calm of this place of worship while feasting your eyes on the amazing architecture. This resplendent church has to figure on your must-visit list of places when in Seychelles.